We're here to talk about an intuitive, fast, and efficient tool to convert both audio and video on a Mac. It offers us high-quality results and can run conversion processes up to 30 times faster than many of the tools on the market. We're referring to Total Video Converter for Mac. It doesn't matter if it's a format of the likes of Windows Media Video or if you've recorded the video on Android. 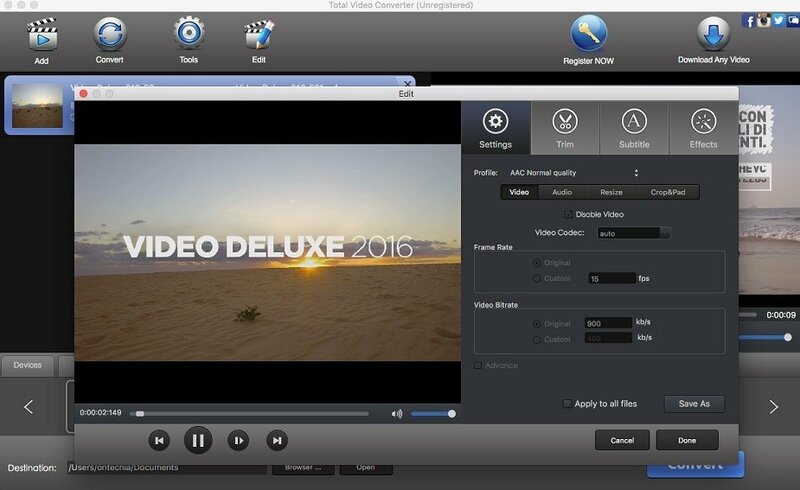 Total Video Converter recognizes the file and is capable of converting it to the format of our choice, whether a video or an audio. In fact, it also allows us to extract sound from video files. Converts up to 30 times faster than some of the solutions on the market. Possibility to combine several videos or audios in a single file. Add subtitles and transition and image effects. Create your own DVDs with its burner. Furthermore, one of its greatest features is the simplicity of its interface, which will allow any user without an extensive knowledge handling computers to master it quite easily. This is a 15-day trial version with limited functions.